With a unique local cuisine, an abundance of ancient ruins and stunning sea and mountain scenery, not forgetting one of the world’s most famous fortified wines, Marsala, much of western Sicily has remained largely untouched by tourism, yet it is within easy reach of the international airport at Palermo. Lured by its abundant fishing grounds, hillside vineyards and coastal saltpans many invaders have left their mark here. 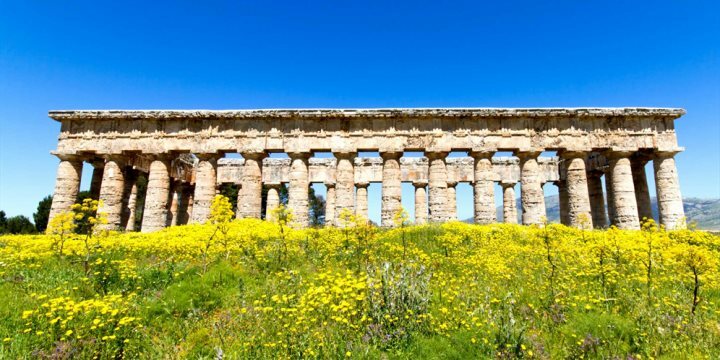 Not to be missed attractions include the ancient ruins of Segesta, principally the Doric temple and the mountain side amphitheatre, the views above which are magnificent. At Selinunte, on the south coast, you’ll find magical historic sites including a number of temples, the ancient city itself and the acropolis. Both here and throughout the south west of the island, there are many fine beaches. Heading north along the coast, wine lovers will enjoy visiting vineyards and touring the famous wine cellars around Marsala. The harbour town of Trapani, with its maze of narrow streets in its Moorish centre, also has many fine examples of Baroque architecture and is overlooked by the impressive, mountaintop medieval town of Erice, worth visiting for the views alone. 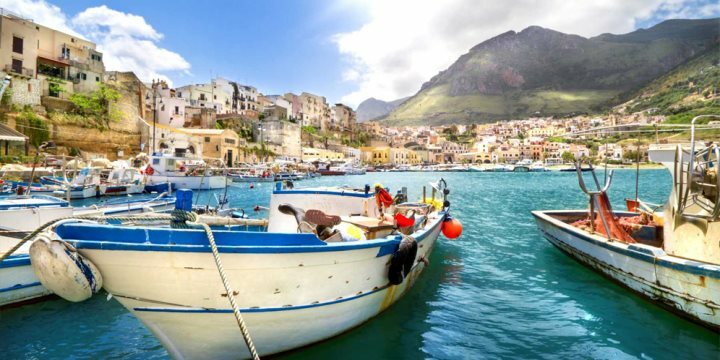 While the nearby Egadi Islands make a relaxing day trip from Trapani or Marsala. Just off the coast of Trapani, a short boat ride away are three islands: The two islands of Levanzo and Favignana are best for a visit. Levanzo is a tiny island with only a scattering of houses, it is completely unspoilst and a joy to wander around. The beaches are not sandy however the water is clear and loevly for a dip. There are some rocky paths around the island and a walk through a small pine forest will take you to some fine swimming spots. Favignana is much bigger with more roads and houses, and a central square with some restauarants and bars. You can hire a bicycle or a Vespa to explore this island if you wish! It takes around two days to cycle around the whole island including stop offs at all of the beaches. The scenery is incredible, with the beaches being rock faces rather than sand however the white stone is warm and ok to lay on. Some of these beauty spots can get busy in the peak season. In the north west you’ll find the famous beach of San Vito Lo Capo, a sweeping bay of fine white sand, and the fabulous hiking country of Lo Zingaro Nature Reserve, which also has some lovely secluded coves.